Blacksmithing tools are hard to find and are an investment for beginners. But we’ve compiled the essential blacksmith tools into one cohesive list! When beginning blacksmithing, you must acquire all the appropriate information as well as the proper tools. There are plenty of blacksmith tools that are nice to have, and some experts may even tell you they’re a must. To do the basics of blacksmithing, however, there are only a couple of tools that you really need. That’s why we’ve compiled our list of the essentials. A forge is a fire or a type of hearth, and it is where you heat your work. You can purchase a ready-made forge or make your own. The important thing is you have a place where you can apply heat to a piece of metal. 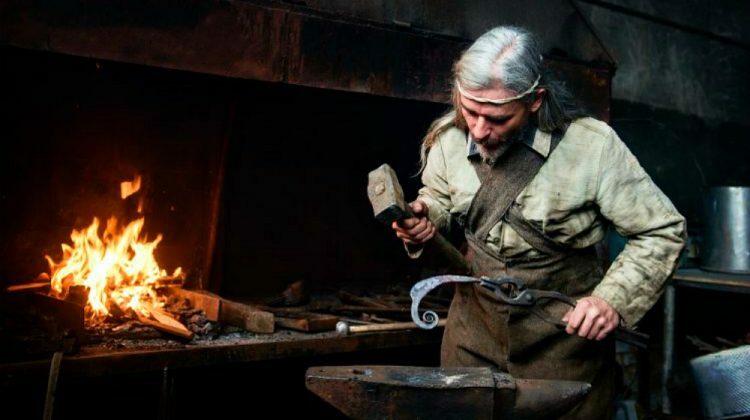 Consider these blacksmith projects for beginners: [VIDEO] How to Make a Railroad Spike Knife! You can probably say, the anvil is the symbol for blacksmithing. Throughout the ages, the anvil has been a trusty tool for blacksmiths! An anvil is a basic blacksmithing tool. Basically, it is a block with a hard, flat surface on which another object is struck. It is where you will be molding and shaping your metal work. The anvil is usually made from cast iron or steel. A good anvil is critical to successful work. You can also make your own anvil. Find out how to, here: DIY Blacksmithing Anvil! There are many different types, weights and shapes of hammers, claw hammers being the most popular and most widely used. However, they are not recommended for blacksmithing because they are soft and crack easily. A small ball pein or cross pein is recommended. For beginners, consider looking for used hammers in auctions and estate sales. As you progress in the craft, you will learn what you need and want in a hammer should you decide to purchase a new one. Tongs are used for holding your work. A tong is a hinged piece of metal which holds hot metal and acts as a very strong, fireproof extension of the hand. When purchasing your first tong or vise, keep in mind that a large or medium-sized example of whichever type you decide on will be more useful than a smaller unit. You will need a good vice to help you with your metal works. The post vice is the blacksmith’s vice. Look for a larger vice which can withstand repeated blows from the hammer. You can find good post vice on a budget also in estate sales and auctions. As a homesteader, you may want to consider blacksmithing and metal works as one of the homesteading skills to learn. This is a pretty handy homesteading skill for small projects you don’t need to pay big money for. When you’re living off-grid, this homesteading skill becomes even more of a necessity. Learn all the basic homesteading skills and go from there to learn more about blacksmithing. That’s all, fellow homesteaders! 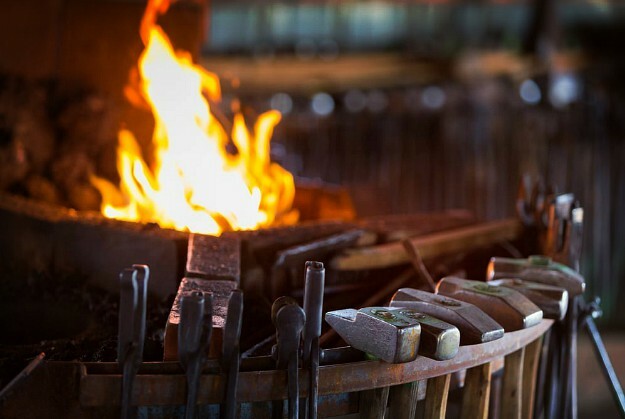 Did you enjoy our list of essential blacksmithing tools? Let us know in the comments section below what troubles you had finding tools or which ones you use in your blacksmithing shop. If you had the basic tools listed above and the skill could you make the other tools you may need later?